1973 After graduating from UC Davis with an MA in Food Science and an emphasis in Enology, Edwards is determined to become a winemaker, rejecting traditional female roles as a laboratory technician. Summer of 1977 Edwards is hired as founding winemaker at Matanzas Creek Winery. 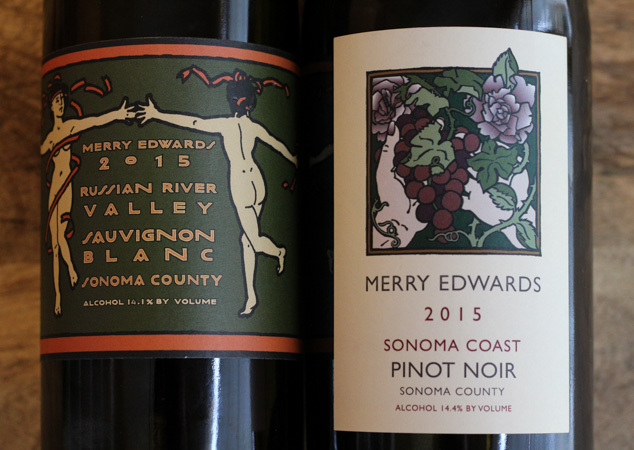 1984 Edwards leaves a successful run at Matanzas Creek to consult and establishes with her family, Merry Vintners, a small winery in the Russian River Valley. 1989 Effected by the downward economic cycle, lenders pull their loans on Merry Vintners and production comes to a halt. Edwards is hired by Vintech as vice president and winemaker at Laurier Winery. 1990 Vin tech files for bankruptcy in late 1990. Edwards returns full time to consulting. 1996 Edwards purchased 24 acres for the future site of Meredith Estate Vineyard. 1997 Edwards co-founds Meredith Vineyard Estate and produces the first vintage of Merry Edwards Pinot Noir. 2006 Construction begins on Merry Edwards Winery and is opened to the public in 2008. 2013 Merry Edwards is inducted into the Culinary Institute of America’s Vintners Hall of Fame. Wins the James Beard Award for Best Wine, Beer, or Spirits Professional in the United States, making her one of three women to win the honor along with; Zelma Long and Jamie Davies. 2018 Merry Edwards is now in her fifth decade working in the wine industry. Her success has come with obstacles, determination, and a self-described trait of being a perfectionist. Light straw in color. Light/medium bodied with medium acidity. Notes of papaya, musk melon, guava, honeysuckle, Meyer lemon, hazelnuts, and crème brûlée. Brillant ruby in color. Light/medium bodied, medium acidity and tannins. Notes of cherries, pomegranate, vanilla, and a hint of licorice. Inspired by a new cookbook, “Six Seasons, A New Way with Vegetables” by Joshua McFadden I made a trio of three vegetable-focused dishes; Freekeh Salad with Swiss Chard, Red Grapes, and Hazelnuts, Roasted Mushrooms with Gremolata Seasonings, and Brussels Sprouts Gratin with Gruyere and Prosciutto. The Merry Edwards Sauvignon Blanc paired well with all three dishes; the wine’s acidity, body, and notes of citrus, hazelnuts and fruit complimented the swiss chard, hazelnuts and grapes in the Freekeh salad. The squeeze of lemon and herbs on the roasted mushrooms also made a nice pairing with the Sauvignon Blanc. And finally, the Brussels Sprouts Gratin with the prosciutto and heavy cream were offset with the acidity of the Sauvignon Blanc. The Merry Edwards Pinot Noir paired especially well with the earthy components of the Freekeh salad and the roasted mushrooms. 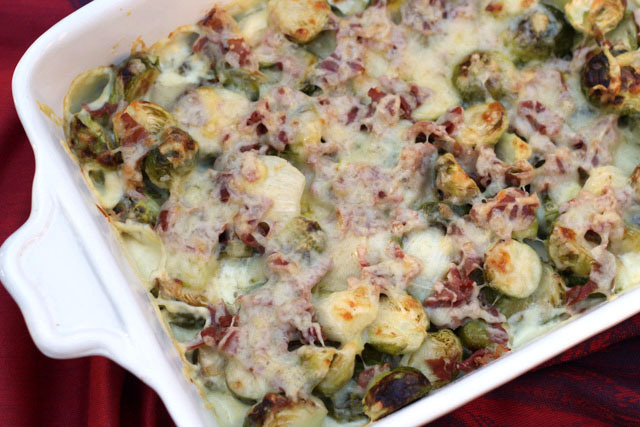 The Brussels Sprouts Gratin was just too rich and overpowering in flavor for the delicate Pinot Noir. In a medium sauce pan, add the freekeh, and water to cover the freekeh by 2 inches. Bring to a boil and then add 1 teaspoon Kosher salt and 1 dried bay leaf. Reduce the heat to low and cover pot. Simmer for about 20 minutes. The freekeh is done when it is chewy but not crunchy. Taste for salt. Drain the freekeh and cool, spread out on a baking sheet. Add a good pour of extra virgin olive oil. Set aside. In a large frying pan over medium high heat add about one tablespoon + of extra virgin olive oil. Sauté minced garlic for about 1 minutes and then add swiss chard ribs and continue to sauté for about 3-4 minutes. Add the swiss chard leaves sautéing for another 2-3 minutes, until leaves are wilted. Cool. In a large bowl combine sautéed swiss chard and freekeh. 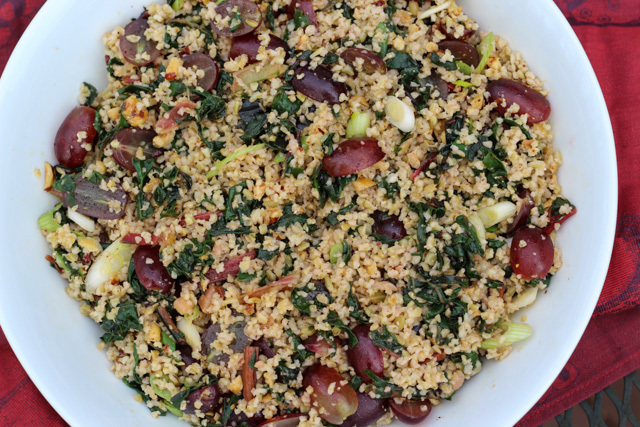 Add the grapes, hazelnuts, and scallions. Stir to combine. Add 1.5 oz. of red wine vinegar, salt, and pepper, and pigment d' espelette. Stir again to combine. Adjust for seasoning and add 1.5 oz. of extra virgin olive oil and stir. Let the salad sit at room temperature for 15 minutes for flavors to mingle. Join Wine Pairing Weekend on Twitter Saturday, February 10th at 11:00 am ET using #WinePW. Check out my fellow #WinePW bloggers and their tributes to women winemakers and winery owners. David from Cooking Chat brings us > Tuscan Kale Pasta with Elisabetta’s Vernacchia. Wine Predator Gwendolyn says > We’re with WALT: owner Kathryn Hall, Winemaker Megan Gunderson Paredes. I love mushrooms with pinot noir. This has been such a great, fun project Gwen. Thanks so much for hosting. 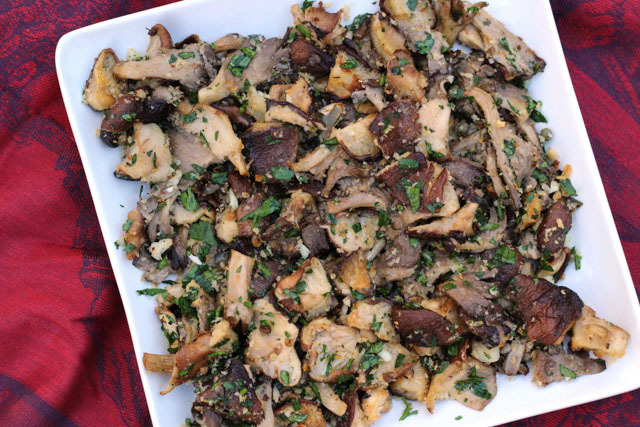 Mushrooms and Pinot Noir are a classic pairing of earthy flavors for sure. Your freekeh salad looks and sounds delicious. I love all the ingredients in the mix and would enjoy trying it. One question: what is freekeh? I assume it’s some kind of grain? In any case, all three of your dishes sound like great partners with the wines you sampled. I love this kind of salad! Freekeh is similar to bulgar. It is a young green wheat that has been roasted and cracked with a nutty and slightly smoky flavor. I found mine at Fresh Market after unsuccessfully trying multiple other grocery stores. Next time, Amazon to make my life easier! Mike has an undergrad and a MS degree in Food Science. That is what is “day job” is. Merry Edwards is a wonderful winery to choose for this month’s theme. She is defiinitely a trailblazer for women in the field of wine. Those brussel spouts look amazing! Food and wine go together! Thanks for stopping by! These all look fabulous and I’m thrilled to meet Merry Edwards through your post. Can’t wait to track some down. What an amazing whirlwind of a journey! On the limited occasions I’ve had a chance to try them, them wines have always been fantastic. The food all looks fantastic as per usual. What a great choice! I wrote about her and several of her pinots last March for Women’s History Month. Now I need to try that sauvignon blanc! I can see why you’d have an appreciation for Merry Edwards! The Pinot and roasted mushrooms pairing sounds especially good.